Bún bò Huế is a classic Vietnamese soup, made with spicy chilli oil and a deeply savoury pork and beef broth. 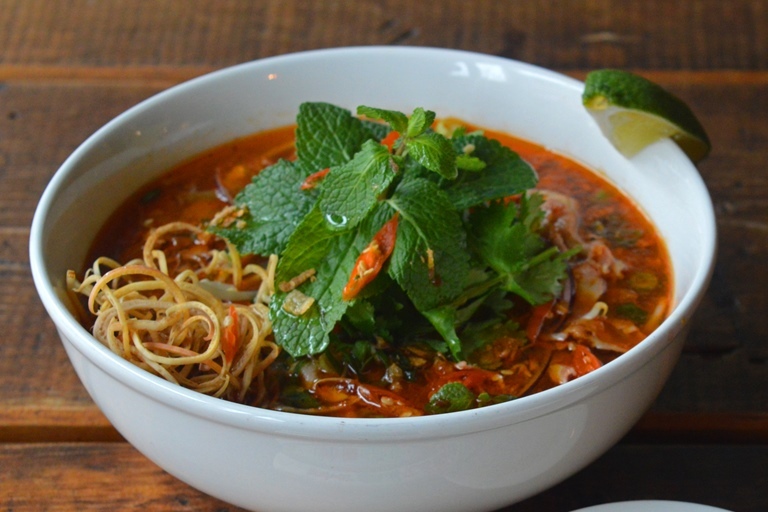 Leyla Kazim came across this wonderfully satisfying soup during her Vietnamese travels and was provided this recipe by Salvation in Noodles owner Colin Tu. Bún bò Huế was one of my favourite soups during my travels in Vietnam, originating in centrally-located Huế, the seat of Nguyen Dynasty emperors and the nation’s capital from 1802–1945. The main difference between this soup and pho is that the latter is made with a chicken and beef stock while the former is made of pork and beef stock. 'Bún bò Huế is a Vietnamese soup containing rice vermicelli, beef and pork. Huế is a city in central Vietnam where this dish originates and is associated with the cooking style of the former royal court. Vietnamese noodle soups take a whole day of cooking so most families make a huge pot of Bún bò Huế and invite friends and family over to enjoy the dish together. The Huế chilli oil used to flavour the broth can be kept refrigerated for months, ready to satisfy a Bún bò Huế craving at any time. It can also be used in stir-fries with vegetables or meat to create a simple, quick, satisfying dish. Just a few notes on where to locate some of the recipe’s ingredients, as most items can be found at your local Asian supermarket. If you are lucky to live in London, you can grab them from Longdan (Shoreditch), Seewoo (Chinatown) or London Starnight (Hackney). The beef shin is a tough cut because of the tendon and sinew, but that’s the reason why it’s so tasty and perfect for a dish like Bún bò Huế. The meat of the beef shin should be soft but the tendons are chewy, so I suggest cooking it for roughly 3 hours. You can find this cut at your local butchers or at Loon Fung in Chinatown, who sell this particular cut at their meat counter. Beef bone marrow and pork ribs can be found at any local butcher or some national supermarkets. With thanks to Kaleem Hayder for the image of this recipe.